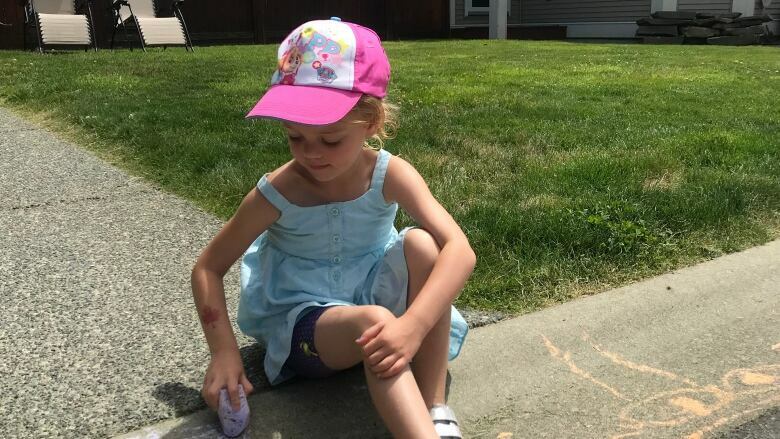 A strata on Vancouver Island is receiving a bit of a backlash after passing a bylaw last week banning children from biking, drawing with chalk and playing outside on the street of the quiet cul-de-sac. A strata on Vancouver Island is experiencing a backlash after passing a bylaw last week banning outdoor play — a rule that is not unusual but goes further than most, according to the Condominium Home Owners' Association of B.C. In B.C., ownership in condominiums, apartments or townhouses sharing common areas is often purchased through an owners' corporation under a strata title. The owners elect a council that sets policy for the strata. Artisan Gardens, a neighbourhood development in Chemainus, about 80 kilometres north of Victoria, voted 15-4 in favour of adopting a bylaw that prohibits using the roadway "for play, including hockey, baseball, basketball, skateboarding, chalk artistry, bicycling or other sports and recreational activities." "There are actually quite a number of townhouse and bare land stratas across the province who have bylaws that regulate what happens on their private roads," said Tony Gioventu, the association's executive director and strata property adviser. Sports like basketball and street hockey are usually prohibited because of the damage they can do to windows, cars and garage doors, he told Gregor Craigie, the host of CBC's On The Island. Safety is also an issue because there have been accidents involving children playing on driveways in stratas. But banning activities like bike riding and chalk drawings is "pretty rare," Gioventu said, especially in stratas like Artisan Gardens that are not senior-specific. "Unless you are in a retirement community that has specific age restrictions, you're going to be in a blended community where you need to exercise some tolerance," he said. There is not much parents of children can do at this point other than seek a compromise with the strata, he said, like choosing a designated area where children can draw and bike ride. "It's grim to say but when you live in a strata, your home is not your castle," he said. "[Parents] may not have a lot of pushback as the strata corporation validly passed these bylaws." Christine Schwabe, who has belonged to stratas in the past, pointed to a shift in family housing options as part of the issue. "Most families in today's economy can only afford to own or rent town homes [or] condos," Schwabe wrote to CBC in response to the story. "If children are allowed there surely we can afford them the right to play and have some independence. Gioventu agreed that a "lifestyle change" is underway as more and more families turn to condos and stratas, requiring a "balancing act" between residents. "It's becoming the new lifestyle for families, so we need to find better solutions," he said. "There isn't always a school playground across the street."